This 3.25-4 oz. 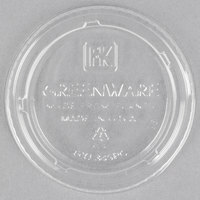 Fabri-Kal Greenware GXL345PC PLA corn plastic souffle / portion cup lid eliminates spills and drips, and is great for use in take-out applications. Nice sauce / liquid to go containers or meal prep containers, especially with the 3.25 ounce container. We use them and even with throwing them in plastic bags or lunch boxes they don’t leak or crack easily. Very pleased! This lid has made life easy. We simply fill the portion cups with our sauces and top it with lid. Helps eliminates spills and drips in our meal prep containers. This lid fits the Fabri-Kal Greenware GPC400 4 oz. Compostable Plastic Souffle / Portion Cup - 100/Pack. With no mess and no spill just perfect. First and foremost, the lid is ultra clear and aesthetically appealing. My main complaint is it’s very squeaky! The sound when this lid is being removed or covered is unpleasant. I tried using cooking oil to prevent the noise, but it persists. I use the 3.25 oz cup w/ the lid, and it is stackable but very inconsistent. The lid has grooves that can hold cups in place but can easily be toppled over. These lids fit excellently on the tops of the 4oz portion cups. They are ideal for being able to seal in whatever item you have in there. These lids fit well on the compatible souffle portion cup that we purchased. The lids fit tightly on the cups and kept them from leaking. We tried to use a sharpie to label the types of salad dressing but that didn't work out too good, thus the reason for the 4 stars. We would still recommend this product. These lids fit really well with their matching portion cup. They are perfect for packed lunches or meal prepping as you can prepare a lot of pre measured snacks in advance. Lids fit very tightly. No chance of falling off in commute or when shaken around during transport. Made in the USA and constructed entirely from plants. These tops for the bottom part perfectly and are very snug to prevent leaks and spills. Also great for more "liquidy" items such are dressings. The Fabri-Kal Greenware GXL345PC 3.25-4 oz. Compostable Clear Plastic Souffle / Portion Cup Lids are a perfect fit for the cups that I purchased. They are great to have for a snack on the go. The quality is very good as well as the price. I highly recommend and will definitely purchase again if needed. I love thes fabri kal lids. They are so clear and seal tightly onto the portion cups. They come in a sleeve and they all arrived in perfect condition. I'm very happy with these lids and their matching cups. They are a little more expensive than their competitors but they are definitely high quality so they are worth their cost. I've mentioned this in another review for the matching cups, but I love using these lids with the corresponding cups for serving guests at parties. Its less messy and more sanitary to give everyone an individual pre-packaged serving than it is to let them dip into a larger tray and serve themselves. I always have these on hand. These Greenware portion cups are made from plants are look nice. The crystal clear lids and portion cups are a more eco-friendly option to traditional plastics. These lids fit the 3.25 oz plastic portion cups I ordered with ease. Not an air-tight seal, but tight enough that you don't have to worry about stuff spilling. I purchased the cups (item #999GPC400) to go with these lids. I use them to hold salad dressings, condiments, and dipping sauces when I pack picnic lunches for my family. I love that the lids are clear so that you can tell what it is without having to open it. It was much more economical for me to buy containers to store them myself rather than buy individual condiment packets…and Tupperware always leaks, which is so frustrating. These transport food well and are disposable/compostable and environmentally friendly. These lids snapped on very easily and fit quite snug. They work great with the greenware 3.25oz souffle cups. Recommended especially since they are compostable! Great seal, and is ideal for the price. I'd recommend buying these in bulk like this to save money rather than buying sleeve by sleeve. This is a sleeve of compostable clear portion cup lids by Fabri-Kal. This 125 pack is perfect for testing out before buying a full case. Lid used for the 4 oz. containers and they work very well. Purchasing these cost a little more in comparison to cheaper brands, but the quality is worth it. The material is compostable so you can feel proud about using these for any occasion. We use these with the 4oz deli containers that we fill with hummus, sauerkraut or tapenade. Never had a spill using these. Fit great and recyclable. My mouth dropped when I saw how cheap they were! And I was even more impressed when they arrived because they were great quality! They fit the container perfectly! They look good and make the contents safe and air tight! I'm very happy with this purchase! These lids fit the Fabri-Kal 4 ounces cups perfectly. We us the cups and lids to fill with salad dressing to provide to the customer "to go". We have never had a complaint from a customer about leaking or coming off in the bag on the way home. I have been buying these for some time now and love them. Exactly what I needed and the perfect fit for the 4oz. portion cup I ordered. These babies are without a doubt, strong and durable. I will be ordering more to stock up. Great job as always, guys! I purchased these to go with the corresponding souffle cups and am super happy with quality and fit, keeps everything in and secure with no leaks. I will definitely re-purchase. It may just have been me being a little too excited and filling the 3.25 oz. Portion Cups too high, but I had issues closing these lids onto the cups, even though they were the ones recommended for it. I ended up going through quite a few of the cups before getting a handle on them, but eventually got them to work. I may order them in the future or I will probably use something a little less thick to put inside of the containers other than cream cheese that won't intrude on closing the lids. Compostable. Awesome. That part makes us happy. Great price point. Awesome. That makes us happy as well. Tight fitting so we are confident that olive oil will not be spilling all over a custom's car. Makes me the most happy. This lids fit perfect on the 4 oz containers. They are strong and tight fitting. Lids don't allow liquids to escape and that's the best part. These fit snugly into their soufflé portion cup counterpart and I haven't really noticed any cracking as some plastic aware does. They seem pretty durable. I use these a lot and I love that they are "Green" , they are for cold items only and they work great for lunches, condiments, the lids stay on firmly and don't slip off. The don't leak. I buy this with the portion cup. The cup and the lid both are high quality and cheap. The cup is good for packing the sauces like ketchup, soy sauce, etc. Recommend! Good lids that do not break easily. They seal well with many types of food, sauces, condiments, candy, etc. I am happy to support environmently friendly products as well. I purchased these by mistake (needed the lids for the foil cups, instead I got these). They were smaller so it didn't fit the container (my fault), however I used them because it would've been more $ to return them, and it worked out just fine. The material is good and didn't break or melt when using with our homemade desserts. These are good sturdy lids that fit the bottoms well. I haven't experienced any leakage as long as they are snapped on securely. Occasionally the tops come melted or smashed on one side and are unusable. Nice lids and eco friendly which is nice. The lid fits super snugly on the portion cups. Super useful for snacks, dressings, etc. Good product. Great lids for great cups! Forms a solid, snap-tight seal with the 4 oz Greenwares Having a different quantity of the lids per pack and cups per pack seems a little silly, but doesn't take anything away from the quality! Just wish they were more heat stable. We all get guilty about the packaging we use in this business so I love that these are biodegradable. They snap on tight and do not leak. Nice tight fitting lids to the 4oz plastic portion cup that I use to make individual portions of treats. A great price for these too. very high quality plastic cup lids. They match the 4 ounce cups and fit perfectly. They are super clear and actually make your food look great. They are marked as green and made of plants. Very nice touch in my organic business. We love these lids! We use them with the small containers for condiments in lunches. We haven't had any problems with them. My husband is fairly tough on his lunch bag, and these survive without fail! What's a container without a lid, right? These snap on nice and tight and I don't have to worry about liquid or solids getting all over my children's lunchbox! like these lids. they are not hard to snap on. dont leak. very good product for a very good price. worth the money. very stacable. These clear souffle / portion cup lids snap on for a tight and secure fit every time! Just right for the cheesecake cups I sell at the farmer's market! used these lids along with the four ounce cup for coleslaw in takeouts. They worked very well, lids fit nice and tight with no spilling or leaking noted.